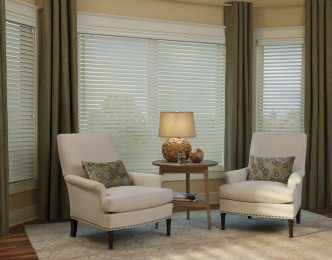 Deco Window Fashions offers top quality blinds for your investment. 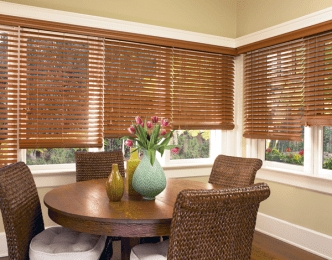 Hunter Douglas EverWood® Alternative Wood Blinds is a smart alternative to wood. Guaranteed against fading, yellowing, warping or bowing. Many clients love Hunter Douglas EverWood® window blinds for their durability, as well as their flexibility to match any style of interior design. They provide the shade and comfort you need while providing a simple, modern decorative aspect to your room. Because of their simplicity, Hunter Douglas EverWood® blinds can be used in any room including children’s bedrooms, living rooms, kitchens, and more! If you are interested in learning more about our selection of window blinds, feel free to contact us at (512) 250-8600, or visit our Austin showroom. We would love to schedule an in-home consultation so that you can match the perfect blind material to your home’s feel and design.